Can't understand history of the West without Judaism, says ASU prof. It might sound contrived, given her area of expertise, but to ASU Jewish studies Director Hava Tirosh-Samuelson, a career in academia is like a secular version of a religious commitment. And when students approach her with the idea of applying for graduate work in history, she tells them so. To be sure, no one could accuse her of such a transgression. For more than four decades, Tirosh-Samuelson has happily lived what she calls “the life of the mind,” and it is every bit as sacred to her today as it was when she began it. That passion, along with her outstanding achievements in her field of expertise, Jewish intellectual history, were recognized when Tirosh-Samuelson was named as a Regents’ Professor by the Arizona Board of Regents in November. Born and raised in Israel, she knew from a young age that she was destined to be an intellectual. Though she showed promise in other areas, such as athletics, music and dance, she always found herself drawn back to books, words and ideas. After high school, Tirosh-Samuelson spent three years in the Israeli army, as is customary for all citizens of the country, and had her first brush with the joys of teaching while training officers. Soon after the army service, her appetite for scholarly pursuits brought her to the Hebrew University of Jerusalem, where she did as she advises her students now and committed herself fully to a life in academia when she chose to pursue a doctoral degree. Her dissertationon an Italian Jewish philosopher and mystic from the early 16th century opened her eyes to the importance of interdisciplinarity. In it, she argued that philosophy and mysticism should not be seen as diametrically opposed, but rather, as complimentary and cross-fertilizing one another. She brought that idea with her when she came to the U.S. in 1977 and taught first in the history department at Columbia University and later in the departments of religious studies at Emory University and Indiana University. She also didn’t say no to sharing knowledge with the public. In 1998, one year before she came to ASU, Tirosh-Samuelson delivered a keynote speech at the annual conference of the Association for Jewish Studies in which she advocated for civic engagement of Jewish studies scholars. At the time, it wasn’t a popular opinion, and she received a lot of criticism from detractors who believed that civic engagement threatened scholarly objectivity. Perhaps it was fate, then, when Michael Crow joined ASU in 2002 and his vision of social embeddedness as a function of the university aligned so well with her own. “I think my vision was vindicated,” she said, not only at ASU but in higher education in general. Back in 2012, the U.S. Department of Education made an appeal to colleges to make civic learning a priority, and several, including Cornell and Duke University, have since put forth initiatives to do so. But ASU was definitely a trailblazer on that front, Tirosh-Samuelson noted, as it is on many others, something she feels has allowed her to do things she couldn’t have done elsewhere. Thanks to the university’s early adoption of cross-disciplinary inquiry, she was able to put together the first faculty seminar on science and religion in 2003, which still exists under the auspices of the Center for the Study of Religion and Conflict. “It’s very exciting to be in a university that sets scientific, cultural and social trends,” Tirosh-Samuelson said. “We shape the conversation in many ways. ASU has superb faculty. The intellectual quality is very high here. And that’s true of the students, too. Over almost 20 years at ASU, she has honed her expertise in three main subject areas in addition to Jewish intellectual history: religion, science and technology; religion and ecology; and women and gender in philosophy. She has written widely on each topic from the perspective of an intellectual historian, exploring what they teach us about the meaning of being human. Ten years ago Tirosh-Samuelson founded the Center for Jewish Studies at ASU, which serves as both a research operation, bringing together experts across disciplines, and an outreach operation, hosting guest lectures, exhibits, book and film talks and more. “There is no town-gown division here,” she said of the center’s work. “My intellectual community is not just the ASU community, it’s the world community,” which she added is relevant to people in Arizona. In 2012, Tirosh-Samuelson began work on what she characterizes as a legacy project: the “Library of Contemporary Jewish Philosophers,” a snapshot of Jewish thought in the second half of the 20th century. Each of the first 20 volumes focuses on a different Jewish philosopher. The final volume, which she is currently editing, serves as an overview of the entire library. “I hope it will inspire others to continue to engage with the questions [the Jewish philosophers] have raised and help lift this conversation among both Jews and non-Jews,” she said. This semester Tirosh-Samuelson is teaching an independent study course that allows her to have personalized, one-on-one discussions with her students. If past pupils’ experiences are any indication, it’s not an experience they’re soon likely to forget — Tirosh-Samuelson still receives letters and emails from students she taught as far back as her time at Columbia in the 1980s. And finding new ways of thinking is one of Tirosh-Samuelson’s favorite things. “Ideas to me are exciting, they are intellectually beautiful and they keep me young,” she said. “I’m never bored. Never. Because there are always more books to read, more people to get to know, more ideas to think about, and more problems to address. … And I want to infect my students with that kind of desire for life-long learning. It’s an adult world, and kids are just living in it. In the show, the audience sees through the eyes of these young characters, who often use fantasy and fairy tales — from mermaids and monsters to Batman and a world painted purple — to cope with tough, adult circumstances and find confidence. “Six Stories Tall” is one of the first productions from the School of Film, Dance and Theatre that fully integrates both dance and theater. Weise, a graduate student in ASU’s theatre for youth program, and Melissa Britt, a dance professor in the school, are co-creative directors for the work. He said it was also important to make sure they were using movement as a narrative form. Learning to incorporate dance and movement into his work was something Angel Lopez, who studies theatre at ASU, found challenging and rewarding. Music also plays a large role in this production. Nathaniel Hawkins, or DJ Panic, will provide the soundtrack. Hawkins won’t just be playing music in the background. In some parts of the show, he actually gets to communicate with the characters through the music. The audience can expect a range of songs from Hawkins. “I’d like to think that my perceptive crates are deep enough that I will play something you’ve never heard of,” he said, but there will also be music the audience will recognize and find nostalgic. In addition to getting help from Hawkins, a staple in the local hip-hop community, Weise also wanted to make sure the play reflected the Phoenix area. 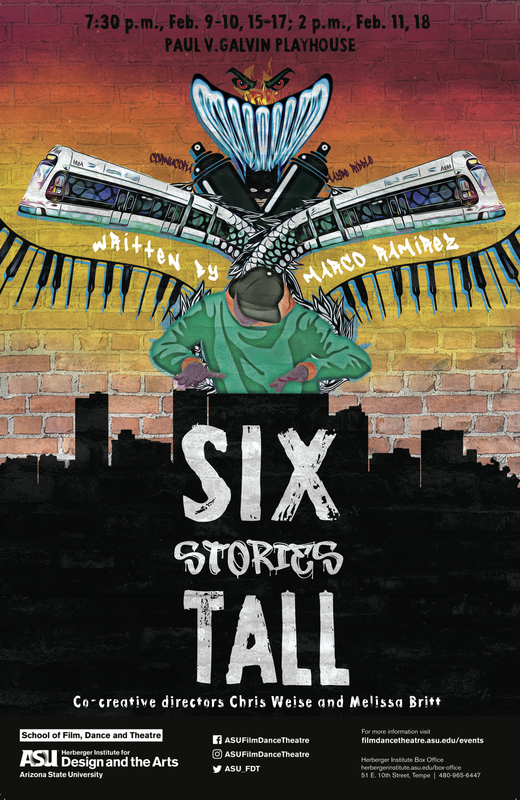 The playwright, Marco Ramirez, set the stories in Chicago. Weise actually contacted Ramirez to get permission to make a few adjustments. For instance, in the story “Lupe and the Red Line Monster,” a young girl uses her mad video game skills to face off against a monster in Chicago’s subway. In ASU’s production, Weise switches it up, creating a Light Rail Monster. Weise said young people are “the champions of the piece,” but this play is for everyone. “It reminds you that there’s magic in the world,” Lopez said. Hawkins hopes people feel that magic. Conversation is exactly what Weise wants. He said when he came to ASU, he wanted to create a piece that was all about getting adults and young people to have conversations. Admission: $16 for general admission; $12 for ASU faculty, staff and alumni; $12 for seniors; $8 for students. Purchase tickets online or call the Herberger Institute Box Office at 480-965-6447.